The recording of simple asset data changes or other manual notes on the assets is often prone to errors, time-consuming and does not conform to recommendations or regulations of the utility industries. With MGC Update, the manual processing of map changes and long delays in the GIS department are a thing of the past. Changes to asset data are digitally processed using object-specific forms. Notes or changes in the network are just as easy to capture using redline objects. MGC Update can be used both in the MGC web client and in the MGC offline client in the same manner. After releasing (MGC online app) or after synchronising (MGC offline app), the updates are available to all users. They are clearly visualised as an additional topic showing the attribute data changes. 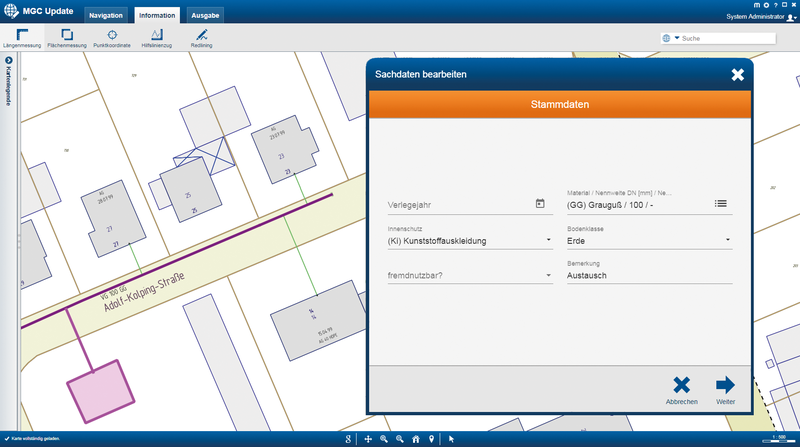 The module MGC Process Management for Smallworld GIS is available for the comfortable further processing of the collected data. Here the data changes can be conveniently imported, processed or rejected. This means that the network data processing can be continued without media discontinuity, thus saving time and resources.